Named a Best Book of 2018 by Fast Company, this is a "sharply written and brilliantly reported" (Shelf Awareness) look inside Reddit, the wildly popular, often misunderstood website that has changed the culture of the Internet. Reddit hails itself as "the front page of the Internet." It's the third most-visited website in the United States--and yet, millions of Americans have no idea what it is. We Are the Nerds is an engrossing look deep inside this captivating, maddening enterprise, whose army of obsessed users have been credited with everything from solving cold case crimes and spurring tens of millions of dollars in charitable donations to seeding alt-right fury and landing Donald Trump in the White House. 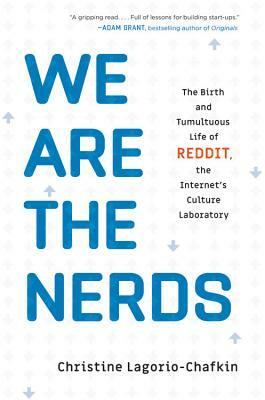 We Are the Nerds is a gripping start-up narrative: the story of how Reddit's founders, Steve Huffman and Alexis Ohanian, rose up from their suburban childhoods to become millionaires and create an icon of the digital age--before seeing the site engulfed in controversies and nearly losing control of it for good. Based on Christine Lagorio-Chafkin's exclusive access to founders Ohanian and Huffman, We Are the Nerds is also a compelling exploration of the way we all communicate today--and how we got here. Reddit and its users have become a mirror of the Internet: it has dingy corners, shiny memes, malicious trolls, and a sometimes heart-melting ability to connect people across cultures, oceans, and ideological divides. Christine Lagorio-Chafkin is an award-winning journalist who has covered culture, emerging technologies, and entrepreneurship for the past 15 years. She is senior writer at Inc. magazine and her work has appeared in many other publications, including The New York Times, The San Francisco Chronicle, and the Washington Post. She was raised on a sheep farm in rural Wisconsin and now lives in New York City with her husband, cats, and toddlers. Her favorite subreddits are r/blep and r/ShowerThoughts. scratch (a struggle I know well). And it's a great story; truly fun to read! start-up story you can imagine, but Reddit's is as fascinating as it gets.